I Gotta Feeling free guitar tab by Jeffrey Thomas. Learn to play this hip-hop classic on guitar with my free tab covering the intro/verse, guitar line and ending melody, finger picking option and song structure. This is a great song for the beginning guitarist. 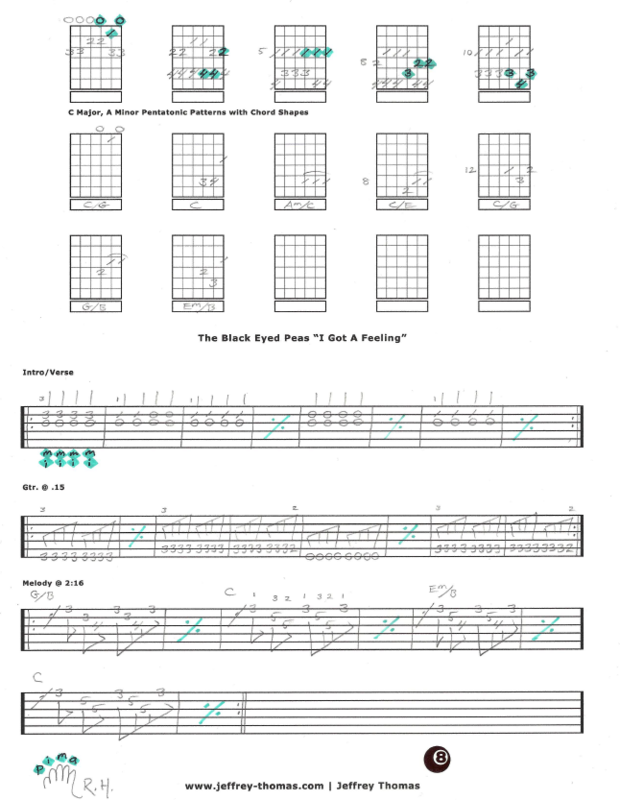 Included in the free lesson are all five pentatonic patterns and chord shapes. This is a highly requested tune by my guitar students who like hip-hop. Want the guitar tab for free? Just send in your email address using the form provided. Looking for the best online guitar lessons? Fill out the Schedule A Free Lesson form to set up your free Skype guitar lesson today! This song reached number one on over 20 charts worldwide! Make sure to check out more free online guitar lessons on my tab, blog and video pages.